A. We are a full gift shop which also offers a fine selection of wine and gourmet foods. We have a baby boutique and a large wedding section with unique selections for your special day. We carry many gentlemen's gifts and beautiful home goods. We also carry many seasonal items for those special holidays. Q. Can I select the items to go into my basket? A. Yes. You can come into our shop and select items to go into your basket or you can call us and our friendly staff can help you select the items over the phone. Q. Can we include wine in our basket? A. Yes. We have a large selection of fine wines and champagnes to choose from. If we do not have what you are looking for please give us 24 hour notice and we will be happy to provide it for you. Q. What do you do for a Sympathy Basket? A. Because we have the benefit of being a full gift shop and also a wine and gourmet food store we provide a few different options for Sympathy Baskets. A basket of comfort foods like teas, coffee, biscotti, fresh fruit, crackers, cheese , nuts and even wine is always a thoughtful gesture. We can also do a soothing Pamper Basket with candles ,bath salts, a picture frame and even a spiritual gift. Q. Can I include flowers and fresh fruit? A. Yes . We create beautiful flower arrangements and fruit baskets but we kindly ask for 24 hour notice. Q. What other containers do you wrap in besides baskets? A. 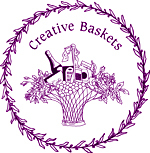 Our basket designers love to create specialty baskets and we wrap in everything we can think of-from hat boxes to pottery, trunks and purses to seasonal sleighs and fall leaf serving trays. You will be amazed at what we can create. A. We deliver all day to Fort Myers, Cape Coral, Lehigh, Sanibel, Captiva, Fort Myers Beach, Pine Island, Bonita and Estero. For deliveries to Naples,Marco Island and Alva please kindly give us 24 hour notice. A. We ship globally through UPS. Shipping fees vary and depend on weight and zip codes. UPS ship time is 3 to 5 business days or you can expedite your order for an additional fee. A. Because we make everything to order the prices vary. We like to say we have something for everyone. In general, the average basket ranges from $50 to $250 dollars. Call us and we will help you with any budget. Web site and all contents © Copyright Creative Baskets 2007, All rights reserved.